Ice box and First Aid Box. We are Travel Park Holidays - a reputed travel company in Gurgaon offering sofa tempo traveller online booking in Gurgaon, Noida and Delhi. Sofa tempo traveller is the most comfortable tourist vehicle for a group tour. 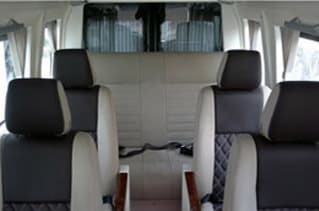 If you going an outstation tour with 9 to 17 seater tourist, you should book sofa tempo traveller. It has pushback sofa seats which and very comfortable and safe for the long journey. We can sleep on its seats because it has a head-rest and neck-rest features. Sofa tempo traveller 1 by 1 and 2 by 2 seating arrangements and you can hire accordingly. Travel Park Holidays provide 9 seaters, 12 seaters, 15 seaters, 17 seater sofa tempo traveller for local tour and outstation tour. Travel Park Holidays is one of those companies in India who has more than 10 sofa tempo travellers. We also modified sofa tempo traveller according to tourist comfort and safety. These types of tempo travellers are the best for a long journey like Delhi to Taj Mahal, Delhi to Golden Temple, Delhi to Vaishno Devi, Delhi to Rajasthan, Delhi to Shimla, Delhi to Dharamshala, Delhi to Jim Corbett etc. This tempo traveller has Ac, Music System, big space leg relief, ample space for luggage and many other facilities.